We’re very excited to announce that Donna May Clitheroe, makeup artist to many celebrities including the Loose Women, will be joining the Brush Wars judging panel for 2018! The Make-up Mat, Gown & Makeup Bag feature a distinct hand embroidered red-lip logo which Donna May is synonymous with. Make-up artist to many celebrities including the Loose Women, Lorraine Kelly, Tess Daly, Melanie Sykes and Ruth Langsford to name but a few, Donna May has personally designed the accessories which are must-have products for make-up professionals and are no kicking starting a trend seen in the hands of said celebrities with a waiting list forming for global orders. With 20 years’ experience, Donna May graduated from the prestigious London College of Fashion, in 1996 and specialises in TV Light Entertainment and Daytime, with many credits including Strictly Come Dancing, An Audience With Take That and currently, the award-winning daytime panel show Loose Women. Donna May is a favourite amongst the Loose Women presenters, having been integral to the ‘restyling’ of the show’s ‘look’ in 2006, and has become essential to its continuing glamorous presentation. 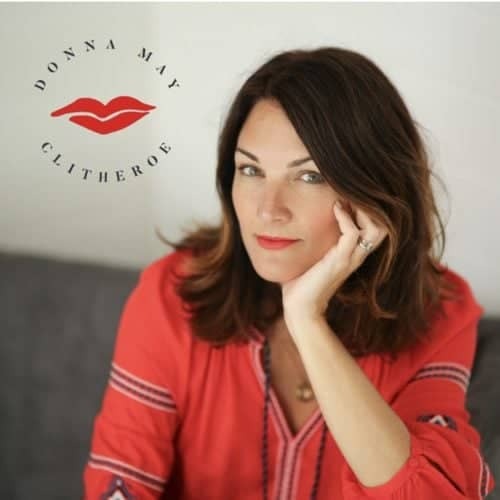 Combining her work at Loose Women with a busy and varied freelance career across magazines, films and television, Donna May is also a popular personal make-up stylist to numerous high profile celebrity clients. She has written for numerous publications in the past, offering inspirational advice on makeup application as well as giving honest and informative product reviews. With added fashion styling, hairdressing, costume and airbrushing skills, she is an accomplished professional with a skill for bringing out the best…in the best!